I’m always fascinated by guitars with lots of knobs and buttons. This appeal has several reasons: the excitement of pressing a button and finding out what it does; the versatility that these options promise; and it makes me feel a little like James Bond in his Aston Martin, controlling a musical equivalent of the ejector button. 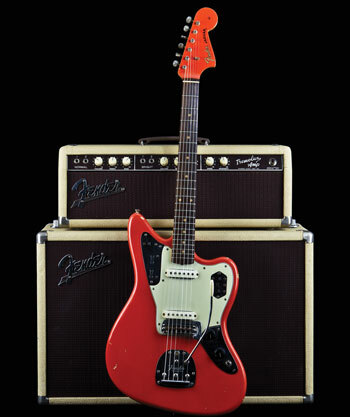 This article looks at guitars with lots of features, especially the Fender Jaguar. A friend at university had a Fender Jaguar, and I was always jealous of the tonal possibilities that lay at his fingertips. 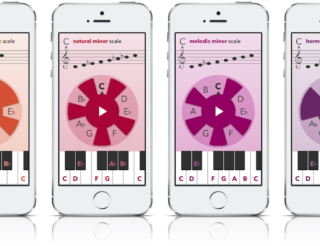 It allows us to play around with as many different sounds as possible. The tonal bandwidth that a guitar offers becomes an important factor, as relevant as tone, playability and style. For example, switching pickups can dramatically alter your guitar’s tone. Single-coils will give you the brighter, twangy sounds. But at the flick of a button, a rounder, fuller tone can be achieved with a humbucker. Similarly, adding a coil shunt (this bypasses one of the humbucker’s coils, effectively turning it into a single coil) is a very simple way to open a new sound colour to your guitar’s arsenal of sound. The standard Fender Jaguar has no humbuckers (some models do), but it certainly offers a wide variety of sounds and effects – as well as plenty of buttons! The Fender Jaguar was introduced in 1962 as Fender’s feature-laden flagship model. 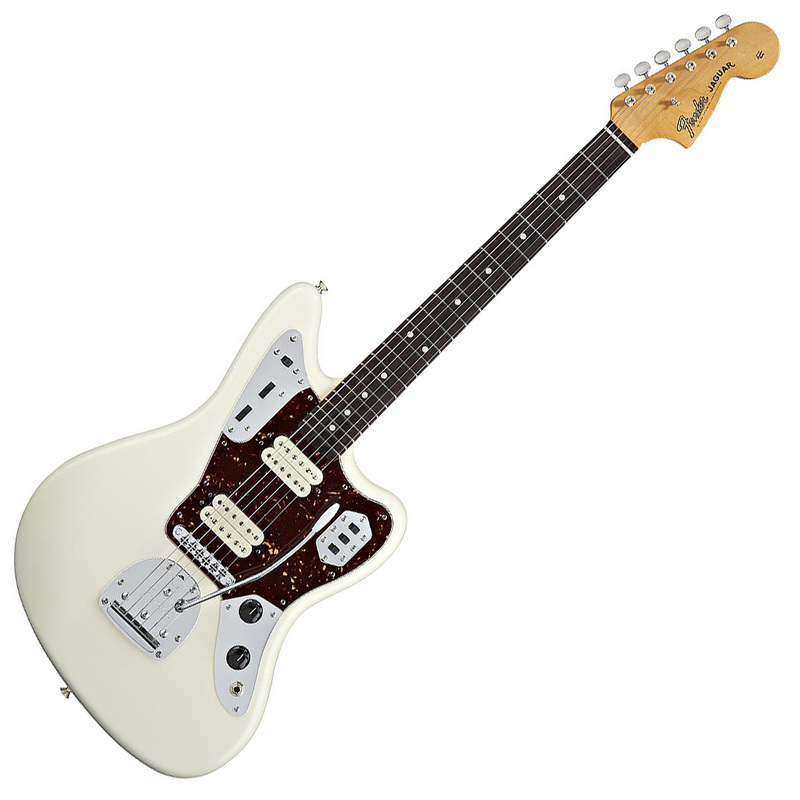 It’s essentially a redesigned Jazzmaster, borrowing heavily from its iconic predecessor. Both instruments share the ergonomic, “offset waist” body shape, as well as a dual-circuit control system. The “lead” channel is brighter and more aggressive, allowing for any pickup combination. The “rhythm” channel uses only the neck pickup and routes the signal through a bunch of capacitors and resistors that result in a dark, mellower sound. Crucially, each circuit has its own tone and volume controls, allowing you to preset both channels independently and simply switch between them. And there is also a “strangle switch” on the lead circuit – this removes some of the low frequencies, giving the guitar a more glassy, thin tone. All in all, the Fender Jaguar has eight switches and dials to play around with! The Fender Jaguar had a short, 24” scale length, giving it an overall rounder tone than its Stratocaster sibling, despite using very similar pickups. But what most distinguishes this guitar is the bridge system. Again evolving from the Jazzmaster, Leo Fender considered this his most sophisticated vibrating bridge. John Frusciante, who played a Jaguar on Under The Bridge, agrees. Through a combination of springs, plates, levers and a bridge that rocked back and forth, the guitar supposedly maintained its intonation better with the vibrato in use. Not great for dive-bombing, but very pleasant for the shimmering vibrato effect that made this such a popular guitar in the Surf music scene. In addition, the mechanism could be locked by pushing a little flap behind the bridge. This is very useful if a string brakes during a gig, as the remaining strings would not go out of tune. The bridge mechanism had another side-effect that influenced the guitar’s tone: the long bits of string between bridge and tailpiece allowed for a lot of sympathetic vibration. This is where strings get excited by the resonance of other strings and contribute to the overall sound (sympathetic vibration is how sitars achieve their characteristic sound). The Fender Jaguar’s sound, rich in harmonic overtones, is often attributed to these relatively long strings behind the bridge. Some players even pluck these, producing a chiming sound that rings eerily for great atmospheric effect. Finally, the original Fender Jaguar featured a string mute – this is a little device near the bridge that gently muffles the strings, emulating the blunter, shorter palm-muting sound. So if you count all the switches, knobs, levers, dials and buttons, you will come close to 11 – that’s quite a lot, compared to a Telecaster’s three. Problems with the Fender Jaguar? Unfortunately, these brilliant new features came at a cost: they were fiddly and confusing for many guitarists, and improper installation often led to tuning problems and frustration. Many removed the string mute, while others tape over some of the buttons to avoid them from being used accidentally. For many guitarists, there are just too many options! 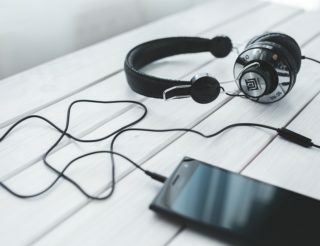 Often, increasing the quantity of options will decrease the overall sound quality. Adding more pickups for example will increase the magnetic pull on the strings, which in turn dampens their vibrational pattern. Gibson’s stripped-down Les Paul Junior was partly so beloved because it only had one pickup, giving it a single amazing sound. Other elements of the guitars playing will also suffer with increased versatility. 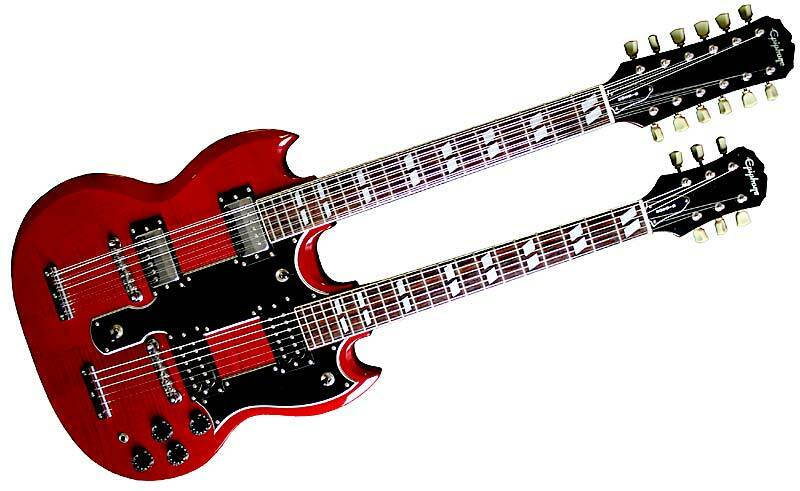 Obviously the weight is an issue – Gibson’s Double-Neck SG model had a six-string and a twelve-string neck, allowing players to effectively hold two guitars simultaneously on stage. Jimmy Page famously used this two-in-one guitar for Stairway to Heaven, but it’s pretty heavy on your back. Breaking down is another disadvantage: the more components a guitar has, the greater the likelihood that something will go wrong. Is the Jaguar a “Jack of all trades, but master of none”? Without doubt the Fender Jaguar is a fabulous guitar, innovative, versatile and great-sounding. It boldly throws the whole “less is more” thing out of the window, and maintains its character despite the endless options. But for the purists, the question remains: should a guitar do one thing really well, or be decent at lots of things? The term, ‘coil tap’ is used incorrectly. 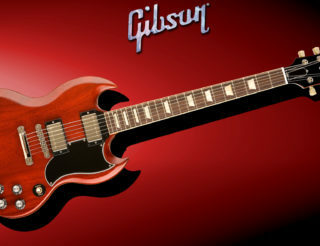 A coil tap refers to pickups that have an extra Hot output that connects to additional windings on the coil. That way you can have a pickup with vintage and hotter outputs by selecting which hot output you select.